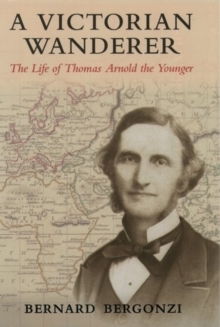 A biography of Matthew Arnold's Catholic younger brother Tom, a scholar, teacher, and self-styled 'wanderer'. Arnold's path in life took him, after a brilliant start at Oxford, to colonial New Zealand, to Tasmania, to Dublin, back to Oxford, and once more to Dublin, where he died in 1900. His spiritual wanderings led him into the Catholic Church, then out of it for some years, and finally back to it. He was close both to Matthew and to John Henry Newman, and hisrelations with them show unfamiliar aspects of these eminent Victorians. As a young man, Tom Arnold knew the elderly Wordsworth, and Arthur Hugh Clough was his closest friend. He was acquainted with such celebrated Oxford personalities as Benjamin Jowett, Mark Pattison, and Lewis Carroll; as a Professorof English in Dublin he was a colleague of Gerard Manley Hopkins; and in the last year of his life he read and approved of an undergraduate essay by James Joyce. The book makes an original contribution to Victorian studies at the same time as telling an absorbing human story. An appendix contains a previously unpublished letter from Matthew Arnold to his brother.